I purchased TWP 100 Cedartone after deciding to replace 680 sq ft of tounge and groove porch on my 1885 Victorian. I sample stained one of my new KDAT yellow pine boards,and noticed it didnt absorb as I had hoped. After consulting with Gemeni coatings tech guy, he advised me to wash my boards with "Deck Restore". I did and it made a huge differance in the stain absortion. Highly recommend this product for new wood as well as old as advertized. BTW, the piece I stained before washing,would not accept more stain when dried, even after washing. This is a testiment to the sealing ability of the TWP 100!! 100 Series after waiting until Spring. Look at the 100 Series for this deck in Georgia that is 20 years old. Make sure to prep well first. I just purchased the 1500 series in dark oak. I have stripped, power washed, sanded, am about to apply the brightener, let dry and apply 2 coats of stain. I understand that the 1500 has good water resisting properties; do I need to seal the deck after staining? What would you recommend? 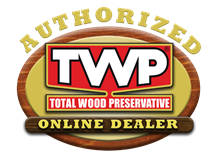 You do not need to nor can you apply a sealer on top of the TWP. I am building a 1000 square foot covered porch in central Alabama using 2" x 6" pressure treated KDAT SYP. Is TWP 100 the best stain for this application? Also, do I need to any prep before applying the stain since the boards have already been kiln dried after treatment? Thanks. Yes you need to let the wood season for a month and prep first with the Gemini Restore Kit for prep before applying the TWP. 100 Series would be best. Curious, we have a 5-10 year old deck, built out of pressure treated lumber. It is quite grey and weathered, though no rotting. Would applying a stain now help preserve the wood? In are in a colder climate. Yes it would preserve the wood longer. Make sure to prep by removing the gray with the Gemini Restore Kit. Which TWP stain has the lowest opacity? All but the gray colors have the same opacity of a semi-transparent. The lightest colors are the Honeytones. We live western Oregon. Which series should we use on a 3 month old Port Orford cedar deck? Have we waited long enough to apply a semi-transparent stain? You are good to go with the staining as long as you prep first with the Gemini Restore Kit first. On a newly painted house will the Restore a deck process, step 1 or step 2, discolor the painted siding or painted deck rails? Does the siding or rails have to be taped off and covered? The Restore A Deck products do not remove paint and should not discolor either. I last used Readyseal Natural Cedar on my North Carolina deck 5 years ago with good results. I am intrigued that maybe TWP 1500 Pecan would be a longer lasting product for my next cleaning and sealing project coming up this fall. I normally use a bleach mixture and lightly pressure wash to clean. How would your product perform over the Readyseal? You would need to remove the Ready Seal when using the TWP. Easily done with the Restore A Deck Stripper and light pressure washing. Use the RAD Brightener when done. Follow up question: On a newly painted house will the Restore a deck process, step 1 or step 2, discolor the painted siding or painted deck rails? Does the siding or rails have to be taped off and covered?